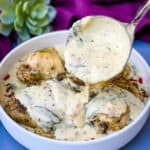 Instant Pot Low-Carb Creamy Garlic Tuscan Chicken Thighs is a quick and easy healthy pressure cooker recipe with sundried tomatoes, spinach, and a cream cheese and parmesan cream sauce. Pour the olive oil into the Instant Pot. Season the chicken with 1 tsp of the Italian Seasoning, salt and pepper. Place the Instant Pot on the Saute function. Brown both sides of the chicken for 2-3 minutes on each side. Add the chicken broth, milk, Better Than Bouillon and remaining Italian Seasoning to the pot. Close the Instant Pot and Seal. Cook on Manual/High-Pressure Cooking for 14 minutes. When the pot indicates it has finished, quick release the steam. Open the pot and remove the chicken. Add the sundried tomatoes, cream cheese, whipping cream, parmesan reggiano, garlic, and spinach to the pot. Place the Instant Pot on the saute function. Cook for 3-4 minutes until the cheese has melted and the spinach has wilted. Combine the cornstarch and water in a small bowl. Stir. Add it to the pot. This will thicken up the cream sauce. If your sauce isn't thick enough add an additional tsp of cornstarch with an additional tsp of water. Allow the sauce to continue to cook until it has reached your desired thickness. Stir repeatedly to ensure the sauce does not burn. Either add the chicken back to the pot with the cream sauce or place the chicken in a serving dish and drizzle the sauce throughout. Cook time noted above includes estimated time for the Instant Pot to come to pressure. Please note, as I mentioned in my blog post, the majority of my meals are cooked for advanced meal prep. I purposely prepare my meals with extra sauce, in this case, cream sauce for freeze and reheat purpose. If you do not wish to have extra sauce in your recipe, you may need to reduce the amount of recommended milk in half.